In this section we will talk about parts of the boat that are used to move it along. The heavy wing at the bottom of the boat in the middle is called the keel. This prevents the boat from falling over when the wind pushes on the sail, and also helps the boat go forward with the sails set. The wing at the back of the bottom of the boat is called the rudder. This directs the flow of the water and steers the boat. The front of the boat is known as the bow. The back of the boat of the boat is called the stern. while the right is starboard. If something is behind another object it is aft of it while if it is in front of something it is forward. Consequently the keel is'forward of the rudder' while the rudder is 'aft of the keel'. When you go alongside a dock or another boat you don't want to bump and grind against it. This is why you put special airbags on the side of the boat called fenders between you and the other object. Right at the stern of the cockpit you will see a life ring. It will be attached to some rope. If someone falls over the side you throw the life ring towards them and turn the boat to get them out as quickly as possible. The space in the stern where everything happens is known as the cockpit. Here you have the steering wheel (the 'wheel"), the winches to tighten or loosen the sails, and most of the sail control ropes will lead into there too. At the bow you will also find a hole where the anchor chain goes (the anchor will generally be hanging off the bow). This is called the chain locker. red on the port side and green on the starboard side. When sailing or motoring at night you need to turn these on so other water users can get an idea of what sort of boat you are and your direction of travel. This is so they can avoid hitting you. When you are sailing, the sails are the engine of the boat. As with the engine for motoring, they are quite complicated but once you know what is what you can set them better and go more efficiently. Let's start with the jib sail, the sail at the front of the boat. The tack is attached to the bow. The clew is attached to the jib sheets that control the shape of then when you set the sail. To get the sail up, you haul on the jib halyard that is attached to the head of the sail. The front edge of the sail is called the luff. By tightening the jib halyard you tighten the luff. Generally speaking you want all the edges of the sail to be tight when the sail is set (not flapping about) so you always want the jib halyard to be as tight as you can manage. Between the tack and the clew is the foot of the sail, and this is tightened by the jib sheets. When sailing you want the jib sheets just tight enough to keep the sail firm, yet by letting it out just a little bit it will flap. In setting it just right you get the most efficiency of the sail. If the sail is flapping then it isn't pulling the boat forward, so to stop the boat you let your sheets go and they will stop the boat. The mast is where the halyards are led through. As well as the jib halyard you also have the main halyard that pulls the mainsail up and down. Attached to the mast at right angles to it is a straight piece of metal called the boom. This is where the foot of the mainsail goes, with the tack attached to the cunningham and the clew attached to the outhaull. These tighten the foot of the mainsail. Again, for good sailing you want the foot tight so at the mast you will tighten the Cunningham and at the end of the boom you will tighten the outhaul. At the cockpit end of the boom you will see the mainsheet. This is led into the cockpit and as with the jib sheet pulls the sail in or lets it out according to the wind direction. Going down wind you will want to let it out, while sailing close to the wind you will tighten it. To stop the boat you let go of it and steer into the wind. The Cunningham also keeps the sail tight from top to bottom. The main halyard pulls the sail up while the Cunningham pulls it down. If the wind gets too strong, you sometimes want less sail up. Sailing can be fun in stronger winds! That's why you have the reefing cringles that are part way up the sail to 'reef the sail'. You would attach the Cunningham and the Outhaul to the Reefing cringles, and re set the sail. With less sail area you will be more comfortable in bigger winds and still enjoy you time on the water. 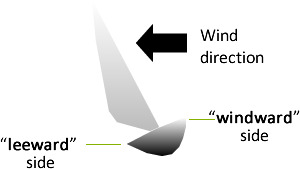 The side of the boat facing the wind is the windward side and the side facing away is the leeward side. 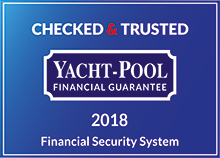 Generally speaking the boat will lean away from the wind, so the leeward side will be the lower side of the boat when sailing. Finally, on both sails in the picture you will see the 'telltales'. These give you an idea as to how well the sail is set. When sailing on an upwind leg - the telltales on both the windward and leeward side of the jib should point aft. If the leeward telltales twirl, the helm should steer closer to the wind. If the windward telltales lift and twirl, the helm should head slightly downwind. Winches are used to pull ropes (also known as lines) when manpower alone can’t pull them. On big racing yachts you will see the biggest guys on the boat on the ‘grinder’ that is just turning the winch. 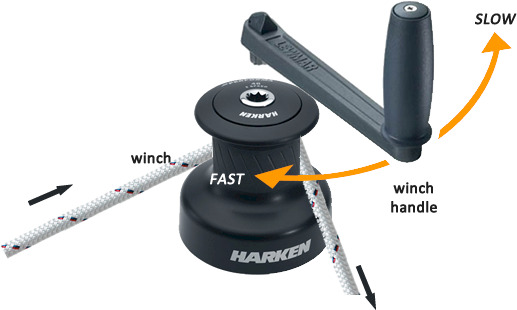 On smaller boats like yours you will only need a winch handle to turn it. Winches are most used to tighten and loosen the jib sheet. Firstly turn the line around it in a clockwise direction for one turn. Make sure that the end of the line with you are pulling from is at the bottom while the end of the line you are pulling is above. NEVER put your fingers between the line and the winch barrel. If there was a sudden gust on the sail it is trimming your fingers could be broken or even removed. ALWAYS use the flat of your hand on top of the line when on the winch. Usually before there is any tension on it you only put one full turn on it and then pull like crazy until there is tension on it. At this stage put two more turns on the winch. Make sure the turns don’t overlap as that could trap the jib sheet and this in turn could mean the boat end up flat on its side in an emergency situation. When you have the turns on the winch immediately put the winch handle on and turn clockwise until you cannot turn any more at a decent speed. If you are quick enough with the winch this might be all you need to do. Once it is too much for your arms alone, turn the winch handle anticlockwise and this will use the mechanics inside the winch to help you tighten it the rest of the way. To loosen rope on the winch, hold the line taught with both hands and ease off the tension gently. One common time you’ll need to do this is when you are tacking the boat. 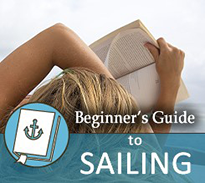 Read our explanation about tacking and gybing later in this manual. On most days tacking and gybing are the most exercise you will get while sailing. There will be lots of noises and dashing about the winches for about a minute and then you can return to your gin and tonics!